I was a single thirty-two year old college writing professor battling post-traumatic stress disorder, standing inside "Saint Meows," a cat shelter in North Cambridge, Massachusetts, peering at a huddled runny-nosed sabo-tabby, when a flash of light ricocheted off the shiny metal bars of the animal cages, catching my eye. I looked up to see a tall dark-haired woman in the entranceway. With one arm she held the door open; with the other, she dropped a small plastic animal carrier to the floor. She exited quickly, and then reappeared with a disheveled scratching post, which she flung from her grasp as if it were deadweight. She barked, "Is that it then?" to no one in particular; she did not wait for an answer but turned her back, and, with a brusque hand, slammed the door behind her. There was a moment of silence, the air filled with some kind of shell-shock, which was broken, finally, by a loud, long meow that leapt up from the floor. I recognized the sound, a voice crying, I've been hurt, love has died, hope is gone, I'm so afraid. 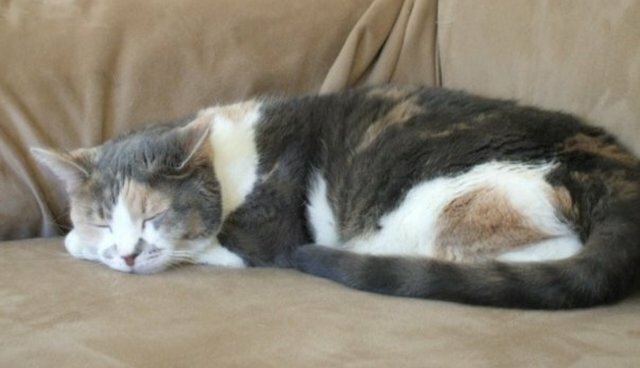 Her tail tip was broken, her crème-calico coat smelled of garbage, and her ears were plugged with dirt. She flinched whenever a hand went near her. She would not eat with her back to anyone, if she ate at all. Her name was Hannah, and when I rescued her I had no idea that she would, in turn, also rescue me. It was 2006, and I was in therapy, trying to wrap my head around the trauma of my past. Living with me, Hannah was coming to terms with her own past as she acclimated herself to a new, loving home: cautious, she only allowed me to pet her if she was in her cat bed; she peered at visitors in fear; she trembled at the sound of a man's voice. Together, we helped and healed each other. One day, after a particularly intense therapy session, I sat beside Hannah on the couch. Her body lay in a semi-circle, the white of her belly exposed. My tears dampened her fur. I placed my palm where I could feel her rise and fall as she took in life and let it go. Closing my eyes, I focused on the vibration of her quiet purring against my hand. Every once in a while, she lifted her nose to blot my tear-drenched knuckles, and then rubbed the side of her cheek up my arm. Suddenly, she sped away as if beckoning me to chase her. With abandon, she dashed down the stairs that led to the apartment door, and waited for me. I held onto the railing and followed, feeling beneath my feet the rough grass-green carpet that rolled down the steps like a tongue. When I was almost halfway to the bottom, Hannah emitted chirpy giggle noises and, like a bullet, shot past me, up the stairs, tagging my leg with her tail-you're it!-opening up feelings within me that I had not felt in decades, parts of my spirit I thought had died: affection, playfulness, love. As I chased after Hannah, laughter came loose in my throat. Joy fluttered in my chest. This is the first of a series of vignettes chronicling the story of the author and her two rescue cats, Hannah and Sam. Learn more about Tracy Strauss at www.tracystrauss.com.